Commonly a zettel gets a title and a body. Both are part of the content. And the title is on a more abstract level than the body. What I've found is, that for me it's helpful to insert another level of content between title and body. I call it an abstract. I get two handles on a zettel instead of one to jog my memory and stir my imagination. And by thinking about an abstract (usually after I wrote the body) I process the body once more for better mental linking, I'd say. Why not just make the title a bit longer ? @ralfw > The abstract is less catchy than the title and much shorter than the body. That way I enrich my browsing experience with more depth. Not sure about its display in a list. I want a cleaner screen, fewer distractions to get in my way. I love this idea of enriching a note. Anything that simulates enriching. I sense this would be only for longer notes. Maybe on summary/structure notes. But most of my notes I try to keep to the notion of one idea - one note. Maybe my problem is that I'm stuck with small ideas! 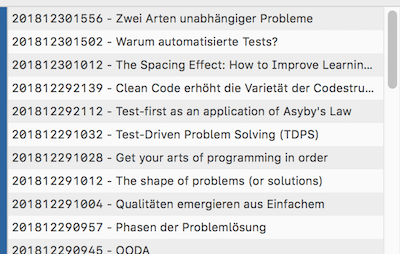 One thing that I've always wanted with my notetaking experience is a way to rank my notes on the amount of enrichment in them; linking, tagging, verbiage, other markup, the ratio of self-generated text to quotes, number of times a note was accessed for updating or use. @achamess No, that's https://www.notion.so. Airtable allows to define different views on tables but does not support marked-up text well. I would not use it as a knowledge store which is primarily about unstructured data. @Paul_J_Miller If a zettel does not have more structure than filename + file content as with TA when you have to use the filename. Technically that works - but I find it overloading the filename with purpose: 1. order notes with the timestamp, 2. give notes a title, 3. provide an abstract. I prefer a tool where a zettel can be more structured. @Will There just seem to be two different kinds of people or maybe two different views on what "cleaner screen" means. I find a display with adequate and explicit structure cleaner than a list where all meta-data needs to go into a single structural element (e.g. filename). And I find it perfectly "clean" to display more than a title in an overview. But that seems a matter of taste. An abstract sure is not necessary for every zettel. If the title says it all, if the note is small, then an abstract might not add substantially. But the longer a note the more I find it useful to reflect on it at the end and extract an essence. To have a metric for "enrichment" sounds interesting. In Coda you could create a property where you can give table entries a star rating. In Notion I'd add a single select property "Enrichments" and maybe create tags like "low", "medium", "high" or the like. Those are not abstracts but rather alternativ titles or a bunch of keywords. I'd rather recommend to the one senctence abstract I outlined in the book. The latter one is also available in English: How to take smart notes. The books are looking at the ZK method from different angles. Sascha's Book I found more practical, Sönke's book is more fundamental, more conceptual. Both perspectives are very valuable.